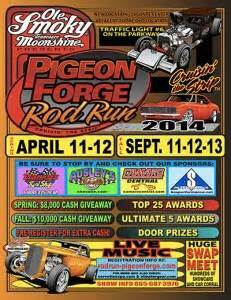 Formerly the Fall Grand Rod Run, the 2014 Pigeon Forge Rod Run is the last of the three biggest car shows of the year. Along with the new name is a new location, the LeConte Center in Pigeon Forge. Join the festivities, including live music, door prizes, awards and a huge swap meet with hundreds of showcars. 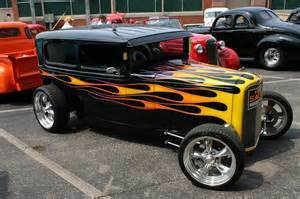 For more information go to www.rodrun-pigeonforge.com or call 865-687-3976. This Pigeon Forge rod run is one of the largest in the nation as it draws thousands of visitors and classic hot rods for miles…literally! If you love muscle cars, you’ll need to pack a bib to catch all of your drool at the Pigeon Forge Spring Rod Run. Just about every make, model, and color of every muscle car made can be found at this Pigeon Forge car show. Vendors are also setup selling hard-to-find parts and accessories for classic hot rods as well.